Home Tips	Outdoor Spaces at the New Place! Happy Monday, Friends! I hope you had a great weekend! We are still unpacking boxes but are slowly settling into our new house. I can not take credit for this fabulous home as it was the previous owner’s design. They designed a beautiful house with attention to every detail and lots of great outdoor spaces! My husband, Brad and I love being outside. As does Lacey. Therefore having great outdoor spaces is important to us. And who doesn’t love a great view? We have a fantastic view at our lake house and once we saw this one, we were sold! So this is the back of our new house. Classic hard coat stucco and stone. I admit we were a little gun-shy about buying another stucco home, but this one is “hard coated” which is supposedly better and it passed a stucco inspection so we feel good about it. We decided to name all of the outdoor spaces so we’d know which area we are referring to. This area directly off of the dining area and the screened in porch is called the Terrace. We added our old patio furniture and it fits perfectly! I couldn’t resist buying some flowers already! Who else loves million belles or Calibrachoa? My favorite flower trick is to buy a hanging basket and cut off the hanger. Then I just plunk it in a container for instant fullness and wow factor. And my favorite color is pink! This is the screened in porch off of the terrace and master bedroom. I think so far this is our favorite spot! I’ve named it the Loggia, just because I think it sounds cool. (A loggia is a covered out of door space so I think it fits.) The previous owners thought of everything! In addition to the floor to ceiling screens they added a ceiling fan and lights. It’s the perfect spot to have a cup of coffee in the morning or a glass of wine in the evening. Lacey loves this spot as well. It gives her a bird’s eye view into the trees where the squirrels love to play. There is a huge Cryptomeria tree that provides a nice privacy buffer between the houses and makes it feel like we are in a tree house. We had a large Crytomeria at our last house so this makes us feel right at home. The Loggia still needs a bit of work (i.e. decorating) but at least for now we have comfortable seating and places to put a drink. The area below the terrance and loggia is the new Veranda. It has great views of the golf course and is completely open, yet covered. It also has lights and ceiling fans which keeps the air moving and keeps it comfortable on those hot summer days. There are two pots of Confederate Jasmine climbing up two of the columns. It must have taken years to train them around the posts. The inspector advised removing them as the vines can compromise the mortar and stone. So, my first thought was to cut them down to clear the view and save the columns, but now I like the coziness of the vines. Especially after they bloom I will probably fall completely in love. Isn’t it funny how you need to live in a house for a bit to appreciate the character? At the far end of the Veranda is a nice little sitting area. This area is directly below the Loggia. (you can see the Cryptomeria in the background.) It’s a nice spot to sit and watch the golfers or take a nap as we’ve discovered. There is a beautiful stone fountain on the opposite end. It sounds so soothing when we are outside. Yet Lacey thinks it is there for her convenience. It didn’t take her long to figure out she can prop her feet up on the edge and get some fresh water. 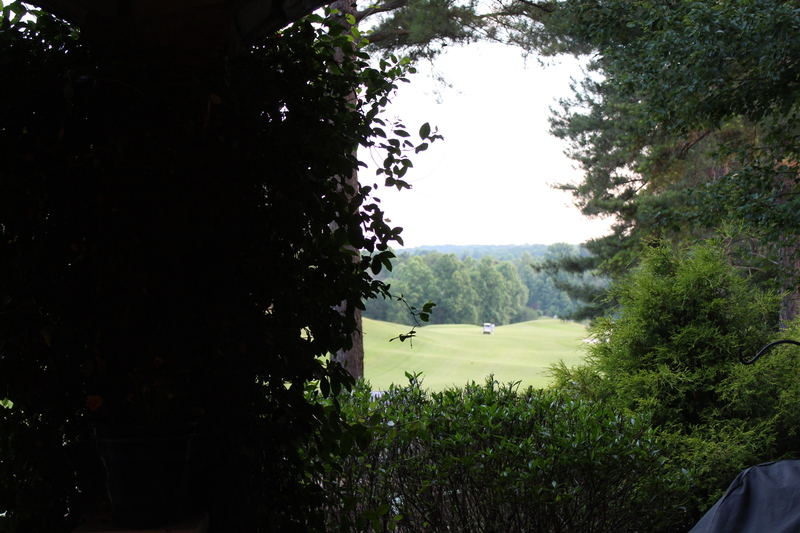 And the best part of the house is the gorgeous golf course view. It never gets old. One of our favorite parts of buying an existing home is all of the extras are already built in. It takes years to establish a lawn and landscaping and it is already done for us. We just get to enjoy the fruits of someone else’s labor. It goes full circle. The folks that bought our last house have the pleasure of a fully landscaped yard too, with all of the extras that costs tons of money. We are still unpacking boxes and moving things around but we are getting there slowly but surely. At least at the end of the day we can prop up our feet and enjoy the view! Dell, thanks a lot for the post.Really thank you! Much obliged. Thanks so much! Thanks for following along!